The memory of the 130,000 martyrs of the eighteenth and nineteenth centuries helps us to face the challenges of consumerism and compromise with power. The prayer for the martyrs of the present times, the Catholics arrested and persecuted by the government in Vinh, Hanoi, Thanh Hóa, Long An, Xuân Lộc, Cà Mau. This is the testimony of one young Catholic to AsiaNews, on the occasion of the feast of the 117 Vietnamese Martyrs, which is celebrated in Vietnam on November 18 (in the universal Church, the feast is November 24). 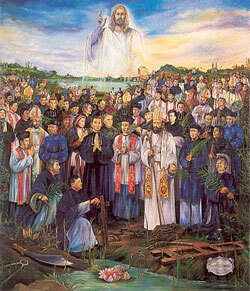 Two days ago, in all the churches and chapels of Vietnam, masses were celebrated in honor of the martyrs. And it was an opportunity to reconsider the way Catholics live the faith today. Today the Church honors 117 Christians who suffered and died for their faith in Vietnam since the 17th century—they stand as representatives for the hundreds of thousands who suffered for their faith in that nation. The canonized group includes 96 people who were from Vietnam and 21 missionaries from Spain and France; eight were bishops, 50 were priests, and nearly 60 were lay people. St. Andrew Dung-Lac was a diocesan priest—he was named Dung An Tran when he was born in 1795 in North Vietnam. When he was 12, he moved to Hanoi with his family so his parents could find work. A catechist there offered him food and shelter, and helped him receive an education. Dung was baptized, and chose the name Andrew—he became a catechist himself, teaching others the faith, and eventually was chosen to study for the priesthood. He was ordained in 1823, and was known as an effective preacher and a model of holiness for those he served. When the emperor began persecuting Christians, Andrew was imprisoned several times, but released when his congregation purchased his freedom. Eventually, though, he was arrested, tortured, and beheaded. Dominican and Jesuit missionaries were the first to suffer martyrdom in Vietnam—they brought the faith to that land in the 17th century. Since then Christians have suffered under political regimes that suspected the faith as foreign influence.